The following article is based on a canvass of products variously referred to as deductible plans, cost sharing coverage, major medical complement or gap plans. For the sake of simplicity and to avoid confusion with Medigap plans for those on Medicare, I refer to these products as Medical Out of Pocket Plans or MOPPs. The goal was to determine the extent of the products and designs, compare and contrast features, and analyze the price ranges for similar offerings. In researching this product line, I relied heavily on public filings and my own product development and pricing experience within this market. MOPPs of any volume date back to 2009 or so and generally coincide with the growing popularity of Health Savings Accounts (HSAs) and High-Deductible Health Plans (HDHPs). The advent of HDHPs moved a larger share of the cost of healthcare onto the consumer. MOPPs were designed to ease the burden of high out-of-pocket first dollar costs on the consumer. The marketplace for MOPPs is almost exclusively made up of group products as they are essentially tied to group major medical coverage. MOPPs are usually sold as group coverage to diminish potential anti-selection by individuals ("I'm buying it because I know I will spend more than the premium and deductible"). Group participation requirements may vary between 100% participation, a minimum level of participation, or individual underwriting if the group participation levels are not met (voluntary purchase). There is no need for reinsurance as the maximum benefit is related to the out-of-pocket maximum of the primary carrier - the primary carrier is the de facto specific reinsurer. Footnote: There are four "Excepted Benefits" safe harbor provisions:1) the plan is issued by an entity other than the primary carrier; 2) the plan is designed to fill gaps in primary coverage; 3) the cost of coverage must not exceed 15% of the cost of primary coverage; and 4) the plan must not differentiate among individuals in eligibility, benefits, or premiums based on any health factor of an individual. I identified about a dozen offerings (principally small group plans) in the market as of the start of 2016 which form the basis of this article. The medical expenses covered are usually inpatient, outpatient, office visits and ambulance. The "cleanest" designs simply state they cover the deductibles, copays and coinsurance required under the primary plan. Other designs limit the reimbursement or put additional conditions on benefits such as ambulance use (accident only, subsequent admission). Office visits also may have a number of visits limit and a reimbursement cap per visit or per person. I feel that the fewer exceptions built into the product design, the more palatable the product will be to the consumer. Matching the coverage gaps of the primary insurance with the product design is key to an effective offering. In a couple of plan designs it was noted that inpatient benefits are not provided. When designing a product, my recommendation is to keep it simple i.e. follow the "clean" design of covering deductibles, copays, coinsurance and out-of-pocket limits of the primary plans. In addition, to truly be a product that covers the cost sharing "gaps" and to avoid confusion for the consumer, a zero deductible/zero coinsurance option is recommended. The following are a broad range of benefit levels found in the market. Two variations are shown of typical policy provisions. The table below shows observed variations in expected distribution by tier. A sample of rate manual factors is shown below. Adjustment factors shown are for illustrative purposes only. Pre-existing conditions and full or simplified underwriting generally do not apply except in cases of late enrollment (if allowed). Waiting periods may apply for new hires. Participation requirements generally apply for voluntary benefits. With virtually no underwriting available for MOPPs, a key concern should be adequate participation and avoidance of anti-selection or "cherry-picking" by applicants who anticipate higher utilization of benefits. Adjustment factors to the rates should be considered based on the number of lives covered or a minimum level of coverage. As noted in the Rate Manual section, group size may impact pricing and loss ratio requirements will vary between individual, small and large groups. Are all (potential) insureds covered on the major medical plan? Are there employees eligible for Medicaid, Medicare, CHAMPUS or Tricare? Are all employees actively at work and able to perform regular duties? Are any insureds currently disabled? Are retirees under 65 eligible? Hours / week requirement for eligibility? (Range from 18-30 hrs./week noted). Does this plan replace similar coverage? How many are eligible by category - full-time, part-time, eligible employees? How long is the desired waiting period? Does the waiting period apply to new hires only or all employees? Any coverage offered via a cafeteria plan? Which benefits? Who is the major medical carrier? What is the major medical deductible, coinsurance, copays, maximum out-of-pocket? What is the major medical anniversary date? Is the major medical cost sharing by plan year or calendar year? The following, while not an exhaustive list of regulatory filing issues for MOPPs, should give the reader a head start on items to resolve prior to filing. Late enrollment may not be a basis for excluding a group member - they may be subject to pre-existing conditions but may not be excluded from enrollment. Ensure the underwriting manual is complete. Rate guarantee factors greater than two years (large group) may not be used. Justify the assumptions for: tiering, multiple product discount, trend rates, participation factors. Underwriting adjustments must be objective. Identify and justify any experience rating methodology and credibility criteria, demonstrate the predictive ability of the method. Age-banded rates should form a smooth progression relative to the claim cost curve. Justify the use of the same rates regardless of the level of employer premium contribution. Provide claim costs, incidence rates and assumed lengths of stay by pricing age and gender for each benefit type. Explain whether claim costs were based on population or insured data. If population data, justify its use. Certify that this product is an excepted benefit under 26 US Code 9832. Explain why this plan is not subject to the loss ratio requirements of the ACA (80% small group, 85% large group). As can be seen from the chart below, premium rates essentially fall into two groups - older and newer products (although there are several caveats noted). Some of the plans have been around since 2011 while others were approved in 2015. Generally speaking, the earlier plans were cheaper and most likely based on a narrower field of experience i.e. less range of cost sharing options. Inpatient benefits now go up to $10,000 or $15,000 maximums but there were not enough plans to compare at those levels. No evidence of subsequent rate increases was found. Another factor which may lead to earlier plans being cheaper is that premiums will tend to go stale due to medical inflation. For example, assume an annual premium of $1,000 and expected claims of $500 for a 50% loss ratio. Now assume two years of medical inflation at 10% (simple interest). Claims will increase to $600 and the loss ratio will rise to 60%. For products with a deductible, the increase would be more pronounced due to deductible leveraging. Consider the previous example with a deductible such that total claims are $750 of which $250 is paid by the insured. The carrier still has a 50% loss ratio at inception. After two years of medical inflation, claims have risen to $900 of which the insurer's share is $650 or a loss ratio of 65%. This illustrates the need to forecast claims to at least the midpoint of the expected shelf life of the premium rates and may indicate that the earlier priced products have stale premiums i.e. higher than intended loss ratios. Riders for ambulance benefits are not shown as the benefit may be for accident only claims or included in other coverage. Benefit amounts also vary considerably depending on ground only or ground/air transport. Physician office visit benefits are typically based on a per visit per person amount with a number of trips per person per year limit. 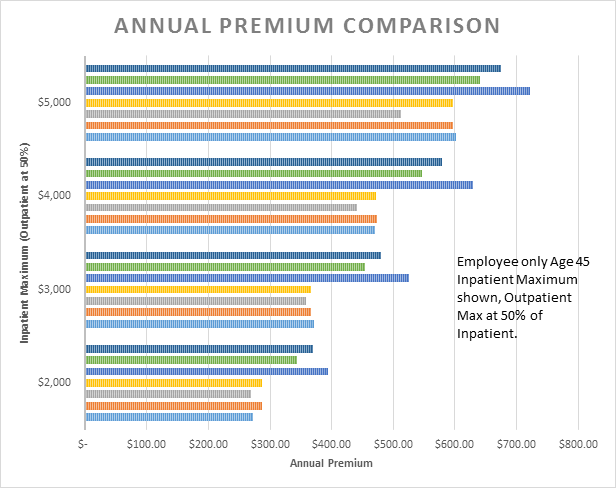 The annual premium for a $25 per visit benefit was found to be in the range of $50-$150 with variations by age range. Some of the cheaper plans shown have a minimum deductible of $250 or $500 rather than a zero dollar option. While every effort was made to keep the plans comparable, the pricing level detail did not allow for accurately determining the cost of each benefit or the assumed value of the deductible. Also, in my sample there are a limited number of actuaries pricing multiple plans so it is not totally unexpected that the rates appear to be grouped. Note in the following chart the split of three plans at higher rates with four plans grouped at lower premium levels. My decision to canvass this product category was due to industry and client interest in MOPPs as a supplemental health plan that avoids many of the regulatory hurdles of ACA products and is becoming more desirable as individual out-of-pocket costs continue to rise. In addition, there currently appears to be limited competition in the market. As MOPPs are marketed toward filling in the "holes" in one's health care coverage, it would seem that the most palatable product design would cover these holes either in their entirety or subject only to a modest deductible - benefit exceptions should generally be avoided or prominently disclosed. Beyond the scope of this article is the impact these products may have on major medical pricing and design. The presence of a lower cost sharing option as a supplement to primary medical coverage may alter policyholder behavior in ways not anticipated by the primary carrier. As always, I advocate the simplest product design possible to streamline the pricing, marketing, administration and regulatory approval process.